Hidden Bridge Estates is a luxury gated community of one-acre homesites. The convenient Jupiter location offers the ultimate in privacy and understated elegance, ready to accommodate an exclusive few. View listings for Hidden Bridge Estates, or read more about this exclusive community. Real estate in Hidden Bridge Estates is reserved for only 16 custom estate homes and is serenely surrounded by natural preserves and sparkling lakes. Homes in Hidden Bridge Estates offer your own private enclave, with 24-hour gated security, only a few minutes from life's necessities and conveniences. It's only 2 miles to I-95, Florida's Turnpike and upscale restaurants, 10 miles to the world-class Gardens Mall, and just 7 miles from Jupiter's exquisite beaches. Nestled amongst several upscale new-construction communities, connected by walking paths, but separated by their own private gates, Hidden Bridge Estates boasts being the most prepared to accept you as a homeowner or builder. Click to view our Jupiter luxury properties: Admirals Cove, Bears Club, Beach Walk, Compass Island, Hidden Bridge Estates, Islands of Jupiter, Jupiter Farms, Jupiter Key, Jupiter River Estates, Pennock Point, Ranch Colony, and Trump National. 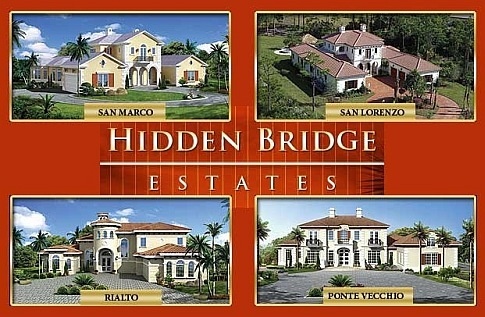 To learn more about Hidden Bridge Estates, please email or call (561) 746-7272 and one of our team will be happy to answer your queries.